The National Hurricane Centre (NHC) is issuing advisories on a number of systems, “three in particular are being monitored by forecasters in this region,” according to the DDM missive. 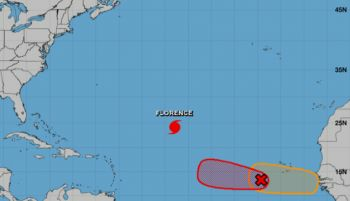 Florence, according to NHC's readings was, at 05:00 AM today, 1100 miles East North East of the VI with its movement forecast towards the North West, with maximum sustained winds at 115 mph. Hurricane force winds extend outward of 15 miles from the centre while tropical storm force winds extend up to 90 miles.